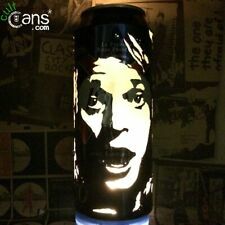 This item is a totally unique, hand-carved beer can featuring a portrait of Van Halen’s legendary frontman. The effect works by placing a tealight candle inside (the base is cut out so the can fits over it) allowing the light to shine through the carving creating this amazing silhouette image which looks very cool in a darkened room… Makes a great one-off gift and a must have for any Van Halen fan! Van Halen Tour T-Shirt 1993. Right Here Right Now European Tour. Van Halen Tour T-Shirt 1993. Right Here Right Now Tour. Condition is Good. Dispatched with Royal Mail 2nd Class. I bought the T-Shirt at the Wembley Arena gig. Size Large. There is a small hole on the left hand shoulder as shown in the photo. Give me a shout if you have any queries ! There is a crease line to the top right corner. The condition is very good plus. A plus or minus after the grading indicates that the condition is marginally higher or lower than the stated grade. Good = Apparent wear and tear but with obvious deterioration of the condition. 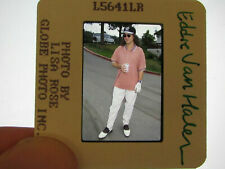 Original Press Promo Slide Negative - Van Halen - Eddie Van Halen - 1993 - Good condition. 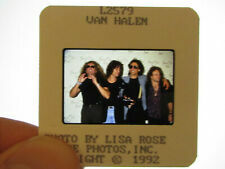 Original Press Promo Slide Negative - Van Halen - 1992 - Good condition. 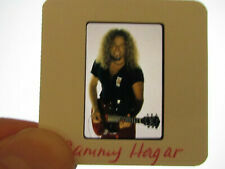 Original Press Promo Slide Negative - Van Halen - Sammy Hagar - 1990's - Good condition. Pit To Pit 22" Approx, Total Length 29" Approx. Large Or Extra Large. Front And Back Motifs In Excellent Condition - No Fading Or Cracking. Th June 1979 as part of their World Vacation Tour. One image has been crossed out with black biro. The images were taken by Bruce Kessler. A previous owner has written the performance and photographer details on the reverse. Front And Back Motifs In Excellent Condition - No Fading Or Cracking. Pit To Pit 25" Approx, Total Length 30" - 31" Approx. Extra Large. Van Halen Is Watching You Vintage Poster. Condition is Very Good. Dispatched with Royal Mail 1st Class Large Letter. Warner Brothers original promo poster for the 1984 album, Size is approximately 120cm x 90cm, has never been hung or pinned on a wall. It has been rolled up for over 35 years! Still in very good condition, some slight creases from being rolled up for so long, but no wear and tear at all on the edges. Will be mailed in a protective cardboard tube. Any questions please ask away. Made in England badge. Condition: Good overall/ very good considering age. 35 - 40 years old. THIN LIZZY Discography-original & live albums. THIN LIZZY Discography-other live & compilation albums. Historical Pix. Reprint, re-recording interview & report. Japan Concert & Live Data. Japan Edition LP Band Complete Collection. 4 Van Halen 1991 metal pins by Brockum. They measure approx. 1 3/4 inches long. Great shape. 3.75 shipping. Original Press Photo - 10"x8" - Van Halen - 1985 - Good condition - Press stamp and proofing process notes on reverse. 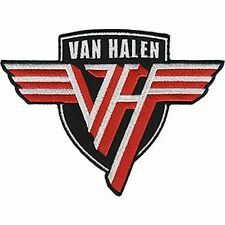 This is a promo turntable mat that was made as a 'value-added' for the Van Halen CD reissues in 2015. The image is of a VAN HALEN Tokyo Japanese concert poster from 21.06.2017. The Japanese leg of this tour was originally cancelled. This is the poster for the rescheduled Tokyo concert. The poster is in excellent condition. It measures approximately 20" x 28". Postage will be in a strong tube via recorded delivery within the UK. Internationally I will only be shipping tracked insured and signed for. 2 RARE PROMO Plates of DAVID LEE ROTH "Eat 'Em & Smile" LAST ONES! THESE ARE FROM A WOMAN WHO ACTUALLY WORKED FOR DAVID~. RARE PROMOTIONAL RECORD LABEL DINNER PLATES. RARE RARE RARE . EXCLUSIVELY designed by David Lee Roth, himself! not conceived and produced by Warners Bros. Records to promote the Tour and distributed to Radio stations. I know---because I was a part of that process! AXE HEAVEN® Miniature Replicas Look Great But Are Not Playable. Amazing Quality! Includes stand and gift box. It has a picture of Van Halen on one side and says Van Halen on the other. 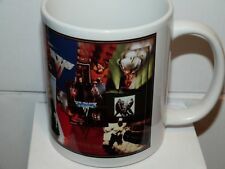 Van Halen Mug. 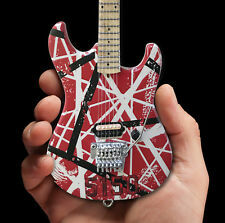 This would be a great gift for any rock fan or Van Halen fan. It was the prototype for Yamaha's future BB2000 bass line. This miniature bass would be a great gift for your favorite bassist! The LP cover is in good condition and this is a must for any VH collector. This was signed on the 2007 Tour. Brad and Team. 7-1/2”x11” neon Style LED light. Light comes with a 6’ 120V power cord, on/off switch, and a chain to hang. Light can also be used with a picture stand (not included). 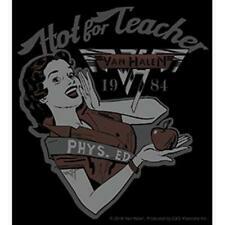 Makes a perfect gift for a Van Halen fan or to hang in the man cave. EDDIE VAN HALEN GUITAR WORLD Magazine January 1984 it has 84 Total pages in VERY GOOD CONDITION news stand copy. Any EDDIE VAN HALEN or GUITAR WORLD fan would like this find. E.V.H Candy Stripe '5150' mug. Ideal gift for a rock or Van Halen fan. Crazy from the Heat is the autobiography of Van Halen lead vocalist and successful solo artist David Lee Roth. We got a case of these from the publisher for a promotional giveaway and they had David Lee Roth sign two of them. A large high resolution 13" x 19" photo of your favorite artist commands the display along with a gold plated 45 record with label and a 4" replica guitar. The guitar has been hand made of wood and the detail is incredible. BIG 14x22 ORIGINAL "VAN HALEN" DEBUT LP ALBUM CD PROMO AD w/ 1978 TOUR DATES! ORIGINAL 11" x 14.5"magazine ad pages for the classic LP & 1978 TOUR! made to combine into one HUGE 21" x 14.5" image (see pic). A FUN, HISTORICAL PIECE THAT WOULD LOOK GREAT ON YOUR WALL! Here's a great collectible for all the old-school fans out there. Van Halen Autographed 5150 Vinyl record Album! signed in sharpie By Eddie Van Halen Alex Van Halen Sammy Hagar Michael Anthony No COA, but included is the sheet from the fundraising auction From Campbell Hall school in Studio City, CA where this item was purchased many years ago! It shows that this autographed album came directly from Van Halen’s Manager etc. Great collectible, 100% authentic. LP record is in near Mint condition too, appears unplayed (I know I never played it!) Ships from Los Angeles. 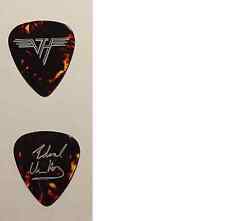 You will receive ONE Double Sided Promotional Flat of Van Halen! There are no tears, stains, edge wear, pinholes or tape marks unless otherwise disclosed! These have NEVER been displayed and have been kept in 3 mil plastic since production! BIG 11X17 FRAMED VAN HALEN "DIVER DOWN" LP ALBUM CD PROMO AD + free extra bonus! FREE BONUS! ONE ORIGINAL 11" x 14.5"magazine ad page for the classic LP. WANT ANY AD. A FUN, HISTORICAL SET WOULD LOOK GREAT ON YOUR WALL! Here's a great collectible for all the old-school fans out there. Artist: VAN HALEN. Label: WARNER BROS. Title: LIVE WITHOUT A NET. Year: 1986. Please see photos for condition specifics. This is used. Buyer will receive exact item as seen. Price is negotiable feel free to make an offer. Thank you. (one page, two-sided) and one b&w 8" x 10" Warner Brothers publicity still. with a two page biography/press release dated August 1996. music industry professionals only. See pictures. What you see is what you get. We love Sammy and basically anyone that has anything to do with Van Halen. We actually loved Sammy even before he joined the Mighty VH. The signature is perfect, the album cover is also in excellent condition. For your consideration is the rare Van Halen Tie Pin that was obtained in the early 80's. Van Halen Genuine Vintage Official Envelopes Business Stationery #10 Window WoW! Van Halen / Cool 1990's Jewelry Necklace / New condition / 1" x 1 1/2"